Hi everyone I have a 3.5 year old black/blue chow that I rescued a while back. My main issue with him is getting him socialized with people, he has bitten a few people with no serious injury thank god. Any aggressive behaviour I immediately act on it and pin him until he stops resisting. I was doing obedience classes with him with a very good trainer, and we had some progress in what we were training him to do but as far as making him not freak out whenever he sees a stranger or hears someone outside is a whole other thing. Training was going well until my s/o and I broke up and left me with crushing debt and having to sell my home. So the past few years was mostly trying to survive, working long hours to make sure we have a place to live but as a result I never was able to attend to the socializing part. He is a really loveable fluff ball with me but he over guards when he suspects he hears something, wines, chuffs and growls over the smallest noise, and he can't do strangers. All I want from him is not to bite every human he sees, I was fortunate enough to find a roommate that is okay with dogs and he has sort of grown used to him but I never leave them alone or away from my side. I was thinking about continuing training again, if I can find some extra cash, but I was also thinking of putting a cone on his head with a wire mesh on the front and slowly introduce him to people. Also the strangest thing...hes not a typical chow, he runs VERY fast, high prey drive but my 5lb cat bosses him around...he also likes to swim...in gross unfiltered man made lakes...>_>. Anyway anybody have some insight on what I should do? 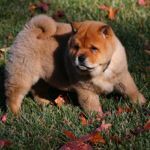 Re: 3.5 year old Chow, aggressive to strangers. Stop tackling and pinning. You are responding to aggressive behavior with aggressive behavior. Try a distraction method if he starts to stress with new people. Call his name at the 1st sign of stress. Use a food/treat and get him to focus on you. When he does, give him the reward. Teach him with positive reinforcement that you are his focus and not any strange persons or dogs. After that lesson is learned, encourage other people he meets to offer the same rewards. What would you suggest for corrective behaviour? I thought pinning would be asserting the alpha role on him. Sometimes when its too late to prevent the action of my dog what would you do to correct the behaviour? My trainer suggested having a penny can that makes a lot of noise, but sometimes those are not just at my disposal. Read my past reply. Positive reinforcement and training so that he react correctly to your commands. Food treats are my preferred option training. Get something he likes and will work for. Bait him with it and train him proper responses before he is rewarded with it. No reward for 'nice try'. He has to get it right. When walking with the dog, he should be looking to you for direction. Work with that treat in your hand, held at your knee or slightly above. That will position the dog in the correct place for both walking and for his 'check-ins'. If you have something he wants, he will be looking for it, and at your hand, not all over the place and 50' down the path. The first thing you need to do is get a crate so that when someone comes to the house you can put your dog up and not worry about him biting. You have to be sure that he does not get the chance to bite again. The next thing is get a copy of Pat Millers "The Power of Positive Dog Training" . Here is a link to her website that has great onfo on it. http://www.peaceablepaws.com/pat-miller.php I always check the used book stores, you can usually find an almost new copy really cheap. Rorys dad is right, get the treats out. You only want to use positive reinforcement. Check in your area and see if there is a local obedience club. They usually provide lessons for a very reasonable price. Any trainer you decide to work with should only use positive methods. Please check out Pats website! If the socializing and training took place years ago and was not consistently reinforced (no criticism implied...stuff happens), you'll probably need to start from the basics again. Take it in small steps. Since he's actually bitten people, I suggest having him on leash whenever he meets people. I agree with the previous advice to stop the alpha roll technique. Prepare the person in advance to be calm and ignore your Chow at the beginning. Pick people very comfortable with dogs at this point; you don't want nervous or excitable people. The humans can talk calmly while the dog sniffs (with you carefully watching and minding the leash) the non-pack member. If your Chow seems calm after the introductory sniffs are complete, the human can go through whatever greeting routine you think is best for your Chow. My pup seems to prefer the person to be closer to the ground (squat or kneel) and offer an open palm for him to sniff. He then usually accepts a gentle chin scratch that can be extended to rubbing the side of his neck. ...he over guards when he suspects he hears something, wines, chuffs and growls over the smallest noise, and he can't do strangers. If you were working long hours and he was mostly home alone, this behavior is understandable. Ideally he would calm down once you've reassured him ("It's ok") that all is well. Like all things, this needs to be based on a well-established relationship with you as pack leader. He needs to be comfortable in knowing that you have everything under control. He'll do his job and bark to let you know when strangers are near, but should stop once you've acknowledged his alert. If your Chow is on the high-energy side, be sure to give him plenty of exercise every day. That should also help with the over-alertness issue. My first Chow was rough-coated and probably average for a Chow energy-wise. But my current smooth-coated pup seems to be quite a bit more energetic. I'm guessing I will eventually need to take him for 2-3 good long walks each day; which is great since I also need the exercise. I was using positive reinforcement training with the trainer I was using before , he was very good. My reluctance and uncertainty is with introducing him to people, even with leash is that he sometimes just snaps suddenly un provoked, even when introducing him to my friend with treats, he still ended up jumping to snap suddenly. I couldn't predict it because it looked like he was doing well. So If I can't use any corrective behaviour I'm not sure what am I supposed to do if he growls or lunges, other than pull back. Also any sudden movements he jumps to it. Right now with my current roommate we've been able to work up so that he can be in the same room with my roommate as long as I am present. I allow him to sniff but call him back quickly with treats. I set a no touch , don't look rule just to be safe, and he can only sniff my roommate if he is sitting down. Exercise doesn't really affect his guarding, 3 runs a day with roller blades in the summer and long winter walks, did help him nap a lot but still would do his guarding routine. Like I said in the first post, the only thing I can think of is putting the cone of shame on him with a wire mesh on the front so that he can get close to people without the chance of biting, use lots of treats and work from there. I'm afraid I'm out of ideas. I'll just repeat that you take it in small steps, which it sounds like you're doing with your roommate. I would, however, suggest you intensively research the cone/muzzle route before taking it. I've never seen such a setup, but it sounds like it would look very off-putting to people. Unless your friends have good control over their emotional reaction, your Chow may pick up on any negative vibes. I'm in the process of training a puppy, so this very basic training philosophy is probably familiar to you. We shouldn't focus on specific behavioral problems to the exclusion of the overall human/dog relationship. (BTW, blading with your Chow shows pretty good communication between you two. My pup still cuts in front of me when simply walking. ) Sometimes the solution to a difficult problem comes by continuing to work on more mundane training exercises: sit/stay, down/stay, come, etc. Again, basic stuff that you're probably already doing. It sounds like this might be an issue but given the limited info, it might not apply...so bear with me. As a chow owner, you must understand that they are naturally head shy. In short, they have very limited peripheral vision and tend to be startled by approaches from above or from the sides. As Drew mentioned, introductions should be at the dogs height level. Instruct people on how to approach your dog. From below and under the chin. That way he is not surprised and can actually see the attention coming. They should talk to him so he knows they are there...no sneak attacks. If that doesnt work, i would suggest a bit of time away from you with a dedicated trainer. He needs to learn that you are not his only friend. Give him a spa weekend where he can relax and meet other dogs and people without the need to protect you. Sounds odd, but it's really good therapy. Thanks for everyones help, I'll definitely keep in mind. I'll try to see if I can find a trainer can specifically work with him so that he knows that other people are not scary. Until then I'll try to work more on the basic commands and with new people, I'll tell them to play rock (don't look don't touch just stay still and at his level), with treats for good behaviour. For now things will be a bit slow, winter is a busy time at work for me, and the summer is when I'll be able to dedicate more time and be able to explore trainers and have the time to get out there. Thanks again everyone! Socialization is a continuous process. When I can find work, it is usually out of town. My wife does not take the dogs out, so they stay at home. I have to take them out and socialize them when I get back in town. They get the idea that they are to protect the wife and the house against all intruders while I am away. Ursa wasn't too sure about me when I got home. It took most of the evening for her to relax. Pinning the dog is not a good idea. I always have my dogs to sit or lie down under any situation where I am unsure of their reaction. First, this puts me in charge. It puts the dog in a more relaxed position. I then let people approach them from the front. I also try to maintain eye contact with the dogs. I will knell down by them to give them extra feed back. I find that chows like to check to see what my response is to the situation so that they can know how to act. Get some friends to work with you. Take your dog to a neutral location and introduce the people to him. 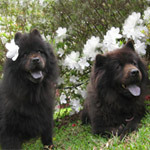 My chows do well in public, but they are defensive of the house. It is their space. Out in public (Pet Smart, Tractor Supply, the vet's) are spaces where they do not feel the need to protect. That helps to shape their reactions. I am not sure if some of the issues are out in public or in your residence. Your chow is going to be more protective of where he lives. When he alerts, you need to respond and reassure him that you recognize the "threat" that he has noted and reassure him. The goal is to train your dog so that he checks with you first before he reacts. Rory's Dad wrote: Stop tackling and pinning. You are responding to aggressive behavior with aggressive behavior. Try a distraction method if he starts to stress with new people. Call his name at the 1st sign of stress. Use a food/treat and get him to focus on you. When he does, give him the reward. Teach him with positive reinforcement that you are his focus and not any strange persons or dogs. After that lesson is learned, encourage other people he meets to offer the same rewards. I agree with Rory's Dad. We do this method also when one of our dogs gets aggressive to our visitors. Our 9 year old rescue chow is the same. We want to stop pinning her when she shows signs of aggression, but it's hard to find an alternative when the safety of the guest is at risk. Should I sit next to my chow and ask my guest to walk in and ignore her and talk happily with me. If she sniffs the guest and seems okay then they can crouch down and scratch her, but still no eye contact? We just rescued 3 weeks ago, but I want to be sure we tackle this problem early on and don't let it go. She's bonded to us already and is so sweet and snuggly with me an my partner. We're working on teaching sit and down and stay which will be a huge help with introductions once she's got them down, but I don't want to stop her from meeting people in the meantime. We love hosting friends and they all want to meet her. She hasn't bit anyone yet, but if it wasn't for our intervention I'm sure she would have. Especially taller, gruffer men. How can I practice without putting friends in harm's way?